The Queen and The Duke of Edinburgh attended a state banquet given in their honor by President Gauck at Bellevue Palace during their state visit to Germany. For more: Sky news article and video, Zimbio gallery. Looks like those of you guessing that Ascot might have been a trial run for the state visit were correct! 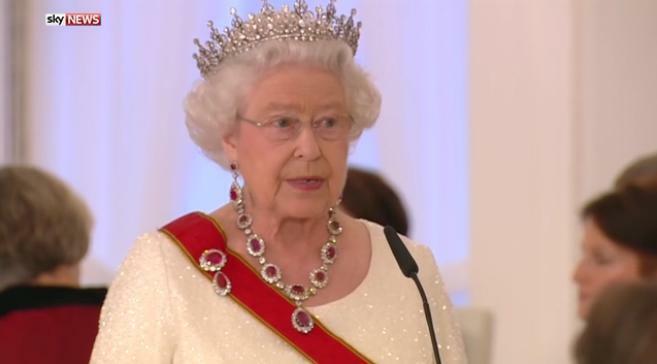 The Victoria and Albert theme continued at the state banquet, as The Queen accented the red of her German sash by reunited Queen Victoria's Crown Ruby Brooch with Queen Victoria's Crown Ruby Necklace and Earrings. She was in a very sparkly mood - which we love - even sporting the Teck Corsage Brooch on her back to keep her sash in place.